Report from Allan Marshall, ride leader. Today was a testing ride with a west to north-westerly wind of about 15 knots all the way to Leathbridge. Helen, George and Maxine decided to leave the ride at Bannockburn as they had other commitments at 12 noon. But the rest of the ride went on, leaving only John & Allan to ride their own ride. Paul led the ‘fast fourteen’ on ahead so as the riders would be split up at the Lethbridge General Store. We were catered for well by the store owner. Before John & I were finished ten of the riders took off leaving 5 of us who stuck together & enjoyed the ride home at 30kph. along the Midlands Highway, getting back to Rippleside Park at 1:55. Thanks, Allan, for a most enjoyable ride, even though some of us had to leave early. At 8:45 I took off for Rippleside Park – a good 400metres of ‘hard slog’ from home. Rounding the bend into Liverpool Street, I couldn’t see any riders waiting near the playground. Oh, dear! Had I got the time wrong? I spotted three fast riders entering the park road from the opposite direction. With a sigh of relief I realised it was the ride leader and his two trusted allies. It would be a small, fast ride, and I was, as usual, ready for a real leg workout struggling to keep up to the lycra lads. When I arrived there were actually three or four waiting cyclists – strong fellows with seriously fast bikes. Then they came in thick and fast, including one who’d arrived at our usual Wednesday starting time of 8am (I’d forgotten to send the reminder email – sorry, John). By take-off at 9am, there were 19 of us – probably a record for Allan’s Mystery Ride – which is the hardest and fastest of the OYB! series. A couple of photos John took while waiting at Rippleside. This ride was no exception, though a strengthening head wind and two punctures made for slow going on outward ride to Bannockburn (see the map for the full route). At this point, with appointments in town, three of us left the ride, enjoyed a coffee, and headed back to Geelong on the Midland Highway, traveling fast and easily with the tail wind. The other group’s route took them to Lethbridge via English Road – a delightful, quiet road. I was sorry to miss it this time, and look forward to doing Allan’s entire 80km circuit when next I chase the lycra lads. This entry was posted in On Ya Bike! 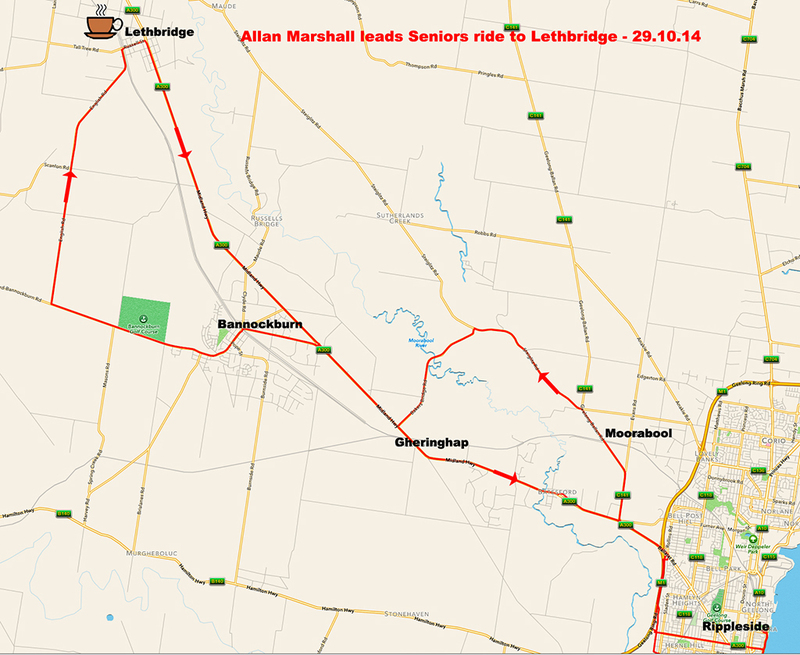 Seniors Month rides, Ride reports by hlyth2013. Bookmark the permalink.